Ships today if you order in the next 14 hours 2 minutes. Auto Ship & Earn + 163 Points What's this? Glutathione or GSH could be the most important of all antioxidants. It is involved in tissue building and repair as well as supporting your immune system. Your liver makes GSH naturally, and it is found in certain fruits, vegetables and meats. But many factors in our busy lives can cause levels of GSH to fall. It could be stress, aging, toxins or pollutants. 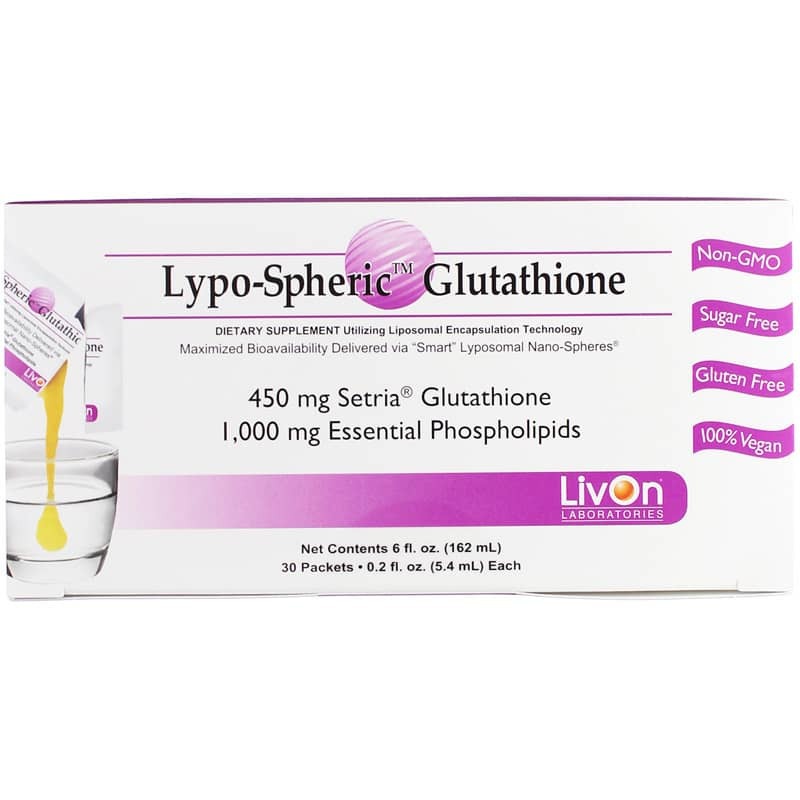 Lypo-Spheric Glutathione from LivOn Laboratories is a dietary supplement that comes as a drink mix and contains 450mg of Glutathione per packet as well as 1,000mg of Essential Phospholipids. It was designed to maximize bioavailability through delivery with "smart" Liposomal Nano-spheres. This potentially transports GSH directly into the blood without requiring your body to find and put together the precursors of glutathione. Because your body uses the three amino acids which are precursors to GSH for other purposes, you don't know for sure if they're going toward the synthesis of glutathione. However, by delivering GSH directly to the blood, LypoSpheric Glutathione can remove those doubts. Using LypoSpheric Glutathione in a hot drink is not recommended. 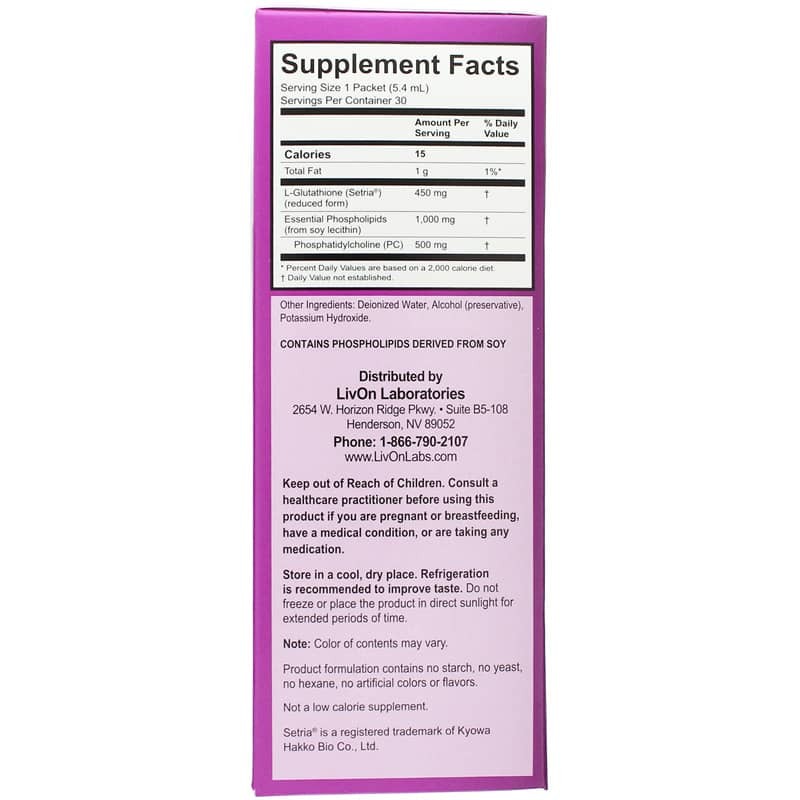 For best results, put this supplement in a cool beverage and drink on an empty stomach. 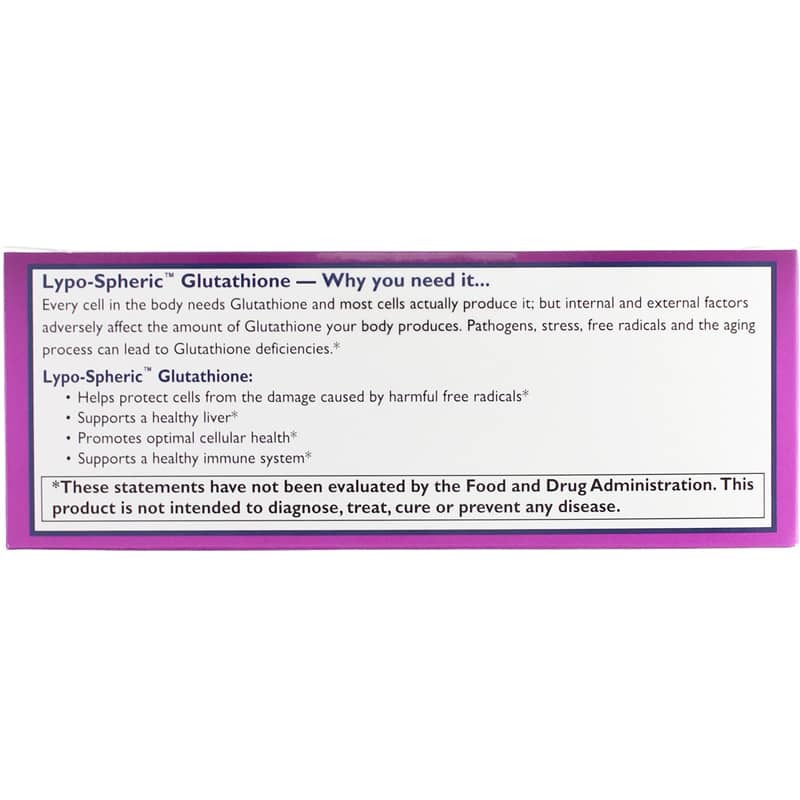 Order Lypo-Spheric Glutathione to support your glutathione levels. Other Ingredients: de-ionized water, alcohol (preservative), potassium hydroxide. Contains NO: GMOs, sugar, gluten. Vegan. 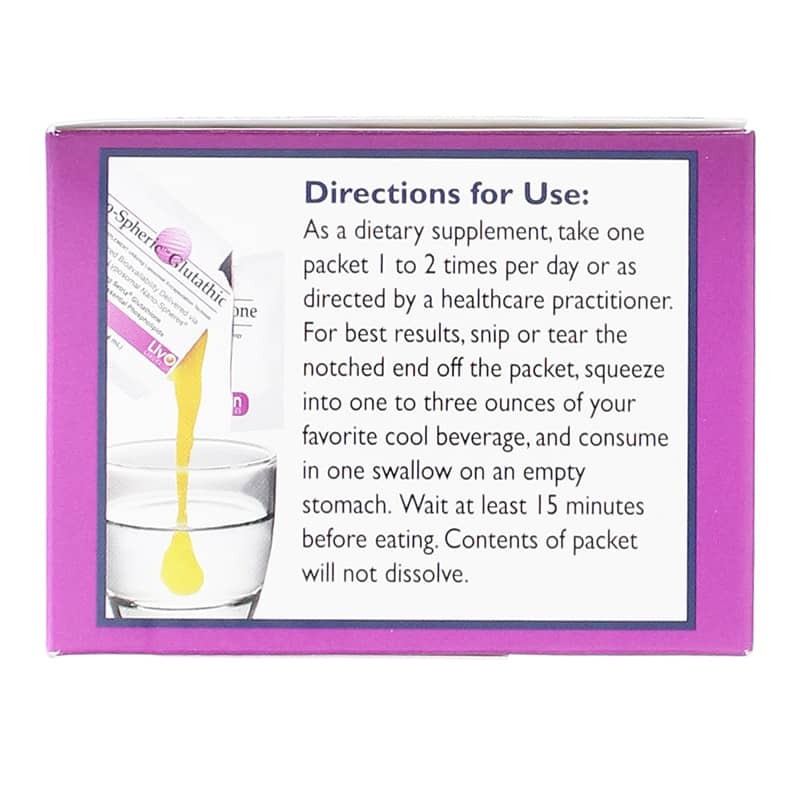 Adults: As a dietary supplement, take one packet 1 to 2 times per day. For best results, snip or tear the notched end off the packet, squeeze into 1 to 3 ounces of your favorite cool beverage, and consume in one swallow on an empty stomach, and wait at least 15 minutes before eating. Contents of packet will not dissolve. Store in a cool, dry place. Refrigeration is recommended to improve taste. Do not freeze or place the product in direct sunlight for extended periods of time. Have been taking for 6 weeks, and after the first few days already noticed improvements in overall well-being, mood, energy and stamina. Super awesome to pre-load in anticipation of a cleanse or detox. I ordered my product and apparently it was stolen out of my mailbox having being delivered to my business on the weekend. I called Natural Healthy Concepts and a human being immediately answered the phone without 17 annoying prompts. They offered to replace the product (free of charge) though it was no fault of their own. They had it shipped signature required to insure delivery. By mistake I was shipped a different product which they gave to me and then sent the originally ordered product. I decided to use the additional product I received and love it! Nowadays you rarely find a company with that kind of customer service. Not only will I continue to order from them but I will order additional products.